This new device, unlike the Tecar and Endotherapy electro-medical devices, allows the physiotherapist to use simultaneously two treatment methods, combining the resistive/capacitive energy transfer and the diffusion of the active agent (where prescribed by the physician), with a hand piece called ROLL-ON (patented). The warming sensation generated inside the body depends on various factors, and can be perceived by the patient at intensities that range from warmth to intense internal heat. When using capacitive electrodes, the diameter of the electrode and speed of movement must be considered in particular. For the same amount of power applied, larger diameter electrodes increase the temperature more gradually and, in addition, the faster the electrode is moved, the less the heat sensation felt by the patient. The operator transfers energy and medicines into the patient’s gastrocnemius muscle .The effect will be hypervascularization of tissue, and consequently its filling with oxygen, nourishing factors, enzymes on the arterial side, and drainage of catabolites on the venous side. It is good practice to choose the electrode with the largest area possible in relation to the area to be treated. The electrode can be applied, both staying still in the area treated and using circular or linear movements, depending on the area treated and power you wish to apply. It is very important that most of, if not all of, the electrode’s area be in contact with the patient’s skin, following any curves and irregularities in the area treated, and continuously adapting to it. The electrode holder handgrip is specifically designed to minimise effort on the part of the operator and to make the treatment more pleasant for the patient (deep massage action, as if the electrode were an “extension of the operator’s hands”). Direct coupling means using the TCARE Cellular Regenerator with uninsulated metal electrodes (no dielectric device interposed). The action mechanism, caused by polarity reversal of the current, produces a quicker and more intense increase in heat in tissue deprived of water and electrolytes (bone tissue and adipose tissue especially). This application method is therefore more indicated, perhaps along with the capacitive mode, for pathologies involving these parts of the body. Since the active electrode is not insulated, the current that moves the charges and the temperature generated in the body are less concentrated in the area immediately below the active electrode, producing a directional aspect guided by the passive electrode (return plate). 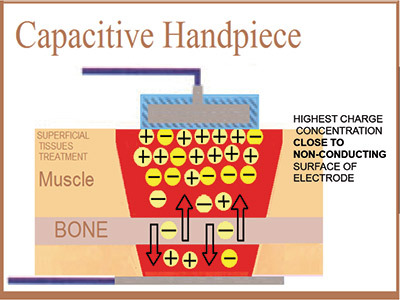 In other words, one substantial difference from the capacitive mode lies in taking great care when positioning the return electrode, which directs impulses generated by the active electrode. Another difference is that the active electrode remains in a set position or slight rotational movements are made with a diameter slightly larger than that of the electrode used, and continually adjusting the power applied so that the temperature perceived by the patient is pleasant. The special patented handpiece, known as the ROLL-ON, means that the TCARE Cellular Regenerator device guarantees the best geometric application for achieving capacitive-resistive energy transfers. The particular shape of the handpiece provides an extensive contact area between the electrode and the patient’s skin, while the ROLL-ON’s functionality ensures that, unlike traditional handpieces, the correct quantity of cream is released at the contact interface on a real-time basis. This is sufficient to guarantee the development of the electro-chemical gradient, without allowing any dielectric arc to be formed. It also makes it possible to avoid wasteful dispersion of conductive cream, which provides significant savings in the operating costs sustained by professionals that use the device. Capacitive handpiece ROLL-ON. must be combined with dispenser cod. EL0148 and its ball caps cod. EL0128. Accessory product for Tcare device. Medio capacitive Roll-On, 56 mm .To be combined with mini dispenser cod. EL0149. Accessory product for Tcare device. Capacitive Mini hand piece Roll-On to treat small anatomic surfaces, 40 mm. To be combined with mini dispenser cod. EL0149. Accessory product for Tcare device. Resistive handpiece ROLL-ON, 80 mm. must be combined with dispenser cod. EL0148 and its ball caps cod. EL0128. Accessory product for Tcare device. Medio resistive Roll-On, 56 mm. To be combined with mini dispenser cod. EL0149. Accessory product for Tcare device. Resistive Mini hand piece Roll-On to treat small anatomic surfaces, 40 mm. To be combined with mini dispenser cod. EL0149. Accessory product for Tcare device. Passive plate. Standard products supplied when purchasing the Tcare equipment. Handpiece cream. 1000 ml - jars. Disposable ball caps for dispenser cod. EL0148. Package of 100 pieces. Dispenser with cap - 12 pieces, for 80mm handpieces. To be ordered with ball caps cod. EL0128. Disposable dispenser for 40mm and 56mm Roll-on hand pieces. Pack of 100 pieces. Ø 40 mm - Ø 56 mm - Ø 80 mm. "About TCARE therapy. Is it possible to use hands free? It means therapist use it leave hands on patient body. (South Korea – March 2018)"
No, TCARE it is not hands free. And neither should any of the other CRET devices be hands free. One of the beautiful and important characteristics of CRET is that it enhances the therapeutic effects of tissue or structure (eg joint) movement. In that respect it is very important the therapist works closely with the patient. Generally treatments to no longer than 20 minutes to achieve the desired therapeutic effects. In many cases treatments are even shorter. "Is the T care belong to TECAR therapy? And what is the TECAR therapy? Is that from Italia? (South Korea – March 2018)." 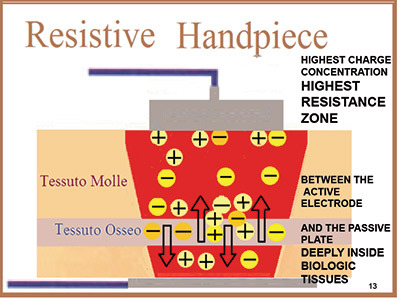 The correct scientific term is CRET therapy; Capacitive Resistive Energy Transfer . T.E.C.A.R. is a commercial name originating from Spanish or Italian language. Yes, TCare provides CRET therapy. TECAR originates indeed from Italy and also Spain. "The protocol of treatment for each indications (ex: the freq, energy, …)? (Qatar – January 2019)"
"Is it ok to put the pad near the heart instead of the belly at cervical treatment? (Qatar – January 2019)"
Taking into account the applicative geometry between the pad and the handpiece, the answer is yes, since the electromagnetic current created by Tcare doesn’t interfere with cardiac activity, except patients with pacemaker who are already forbidden to have Tcare treatment as described in counterindications. Then, I never put the pad in the cardiac area because it is not so much comfortable for the patient: if she’s a female, because of breast; if he’s a male, because of hair which may be present in the area and may require a higher use of conductive cream to gain the proper interface between pad and skin. "Is it allowed to use TCARE if there is internal fixations (ex; metal plate, screws, …)? (Qatar – January 2019)"
Yes, it is possible because of the conductivity of internal fixation material, which is called in Physics “I kind conductor” and which can let the current pass without creating any thermical effect. The difference between I kind conductor and II kind ones is as well described in the training course in order to understand Tcare effects on biological and non-biological tissues.